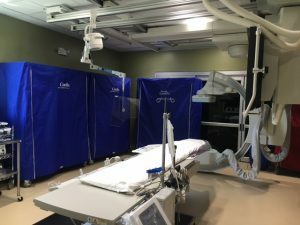 First Coast Heart & Vascular Center’s Cardiac and Vascular Catheterization Lab is a state-of-the-art free-standing cardiac and peripheral vascular imaging facility located in Jacksonville, FL. We provide the best care available in a comfortable location for our patients and their families. Since our Cath Lab is office based, located at 14810 Old St. Augustine Rd, Suite 210 we are able to provide high-quality invasive imaging and interventional care at an affordable price with more comfortable surroundings than any hospital. Our Cath Lab is staffed by specially trained physicians and medical personnel to provide high-quality care and beneficial treatment for patients with heart and vascular disease. A catheterization procedure permits your physician to more clearly define your vascular problem. Specific imaging helps us see the condition of your heart, coronary arteries, arteries and veins of the extremities, arterial supply to your brain and kidneys and other organs and to detect the presence of disease or blockages. Cardiac catheterization: This procedure is utilized to diagnose and treat common heart and blood vessel problems. Until recently it was only performed through the femoral artery in the groin. First Coast Heart & Vascular Center also performs a more advanced, minimally invasive cardiac catheterization procedure in which our physicians perform the procedure through the radial artery in the wrist or forearm. This approach is associated with earlier ambulation, fewer vascular access complications and a shorter procedure time form start to finish. A mild sedative is provided before the start of the procedure to help you relax as well as a local anesthetic where vascular access is obtained. Our highly trained physicians and staff utilize thin, flexible tubes called catheters to access the heart and surrounding structures, kidneys, extremities, and other organs and arteries via small incisions in the groin or wrist. After the catheter has been properly positioned, iodine contrast material will be injected through the catheter and images are taken this allows your physician to see anatomical findings of your heart, specifically revealing the condition of the heart and vasculature. This procedure permits your doctor to see more clearly the condition of these organs in order to discover the existence of disease or blockages. After the procedure is complete, all catheters are removed and the small access site incision is closed. Recovery time for cardiac catheterization is expected to be quick and with very little pain. The findings are discussed immediately after the procedure with you and your family, and treatment options are detailed by the doctor to help you make the best choice for your care moving forward. Peripheral Angiography: This procedure allows the physician to evaluate the presence of plaque build-up (Atherosclerosis)or blockages in the peripheral arteries located in the lower abdomen, pelvis, kidneys, arms, feet and legs. Build-up of plaque in the peripheral arteries can cause pain, especially in the legs when walking, and other conditions are often identified, like aneurysms or complete vascular occlusions. Carotid Angiography: This procedure permits the doctor to visualize the large arteries in the neck that lead to the brain. This procedure is regarded as the “gold standard” for imaging the carotid and cerebral vessels and helps to determine the risk for future stroke, and treatment options to reduce your risk. Peripheral Revascularization: This procedure allows the doctor to treat severe peripheral arterial disease (PAD) by using devices to improve the blood supply to your extremities. Device options include atherectomy devices which remove plaque, balloons, and/or stents. This treatment helps to increase the blood flow where needed. By increasing the arterial blood flow to the patient’s extremities, this procedure helps in the treatment of non-healing wounds, discomfort from walking, swelling and or cramping. Hemodialysis Access Management: Dialysis patients may require invasive imaging of their arterial-venous dialysis access sites, or fistulas, for the purpose of maintaining sufficient flow through them and proper filtration during the dialysis process. Fistula access, imaging and intervention is routinely provided by First Coast Heart & Vascular Center on an outpatient basis. Previously had blood clots in the veins in your legs or pelvis. Had a pulmonary embolism recently. Have a family history of clotting. Required bed rest for long periods of time and cannot exercise. Generally, people with these health issues are treated with a blood-thinning medication. It may be given either given intravenously, injected under their skin, or taken as a pill. However, some people may not be able to take blood-thinning medications. If your doctor believes that a blood-thinning medication will not be safe for you, or will not work he may recommend an IVC filter for you. This service is also provided on an outpatient basis in our Cath lab. Once the date for your procedure has been arranged by our scheduling department, a Cath Lab team member will call you before the procedure and set up an arrival and estimated start time. If your procedure is scheduled to start before noon, please do not to eat or drink anything after midnight the night before. If your procedure is scheduled to begin in the afternoon, a “small” light breakfast is permitted. You make take your daily medications with small sips of water, except for patients with diabetes. Patients on Metformin or blood thinners should discuss cessation dates prior to all procedures with our staff. Important: The procedure start time is a projected time based on the types of cases scheduled for that particular day. Sometimes, cases may take longer than expected due to the severity of a patient’s illness. We are dedicated to all of our patient’s health and safety and we take our time with each case to ensure the best available outcome. Procedures usually last 30 minutes to 2 hours. After the procedure, you will rest in one of our recovery rooms for approximately 1 to 4 hours. Your recovery time will be dependent on several factors including the complexity of the procedure, if you were given blood thinners or other medications during the procedure, and whether vascular access closure devices were used. A light meal will be provided for our patients during the recovery time. You may have your family stay in the recovery room with you. Follow-up Testing: First Coast Heart & Vascular Center is committed to the treatment of our patients with arterial disease, and we believe that monitoring with ultrasound and regular office visits are vital to the success of your cardiovascular health. For more information, you can contact us at 904-423-0010.